Acrospirifer arreutus, a Lower Devonian brachiopod preserved in silica, very abundant in the Glenerie Limestone exposed in a roadcut along Route 9W north of Kingston, NY. As I mentioned in your other Glenerie Brachiopod topic, I like these both-sides matrix-free specimens. Aerospirifer... that is a new one for me! Thanks for posting all these guys. 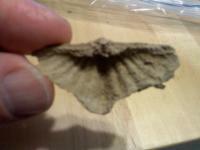 Reminds me of the Macropleura I found in the Licking Creek formation in Virginia. My error. It is actually Acrospirifer. I used David M. Linsley's Devonian Paleontology of New York as a reference. It features copies of lithographs from James Hall's thirteen volume Paleontology, published between 1847 and 1894. It is my understanding that some species names have changed in the past hundred years and so these id's are preliminary at best. Linsley's book is available free online. 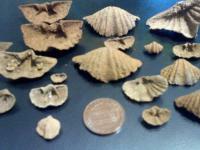 Anyone interested in Devonian brachiopods, mollusks, and trilobites should own it. Linsley's book is a great reference for New York fossils. If you want to go back to the source material, the Hall volumes are available online through Google Books. You can consult the species list starting on page 71 of Linsley to see which volume is the source for a particular plate. For Acrospirifer arrectus, the text is in Hall, 1859 (p. 422-424) and the plates are in Hall, 1861 (Plate 97). When Linsley gives several figures for the same species, I find it helpful to read the descriptions in Hall to see what the difference is between the figures. Hall called this species Spirifer arrectus. According to the Paleontology Database, Acrospirifer is still a valid genus, but they don't have an entry for this particular species, so I'm not sure about that. Thank you for the references. I'm sure they'll prove useful in the future. Nice finds for a roadcut site. The triangular shaped shell in the upper right corner is very interesting. Congratulations.